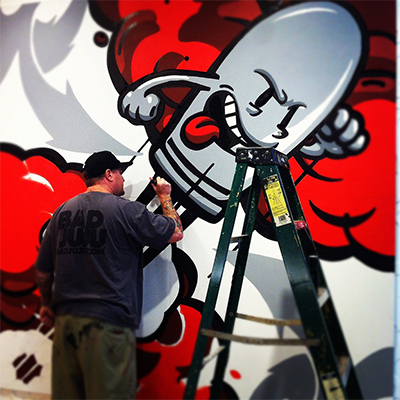 Sket One, painter, illustrator, and designer, has come a long way since his early days as a New Haven based graffiti artist in the 1990s. Though he now resides in Long Beach, CA he still deftly incorporates all the elements that went into his becoming an effective graffiti artist a sharp visual wit, an urban sensibility, and a finger on the pulse of a larger pop culture. Armed with such attributes, Sket One has built a successful career as a visual artist whose work is both acclaimed and in high demand. Sket One's artistic and business ambitions came together for the first time when, in 1992, he created and ran Unitee, a clothing design company. In 2003 Sket One started designing toys for such heavyweight toy makers including Kidrobot, Solid Industries, 3dRetro, Dead Zebra, Red Magic, Play Devil, and more. Always eager to explore additional outlets, Sket One has succeeded in exhibiting his custom work both nationally and internationally in various galleries and shows such as Night & Day (NYC), You Asked for It (London/Birmingham), and Reesurection (LA), Kidrobot Dunny and Munny shows (NYC), and Beyond the Cel (AZ). Sket One displays a passion for uniting distinct components of pop culture into pieces of art that are startlingly cohesive and original. Such innovation has led Sket One to work with Funko, Powwow, Universal Music, EMI, DC Comics, Ford, Toyota, Coca-Cola, Zoo York Skateboards, and Grind King Trucks.